This year’s Bainbridge Gardens’ Pumpkin Walk will be held on Friday October 15th and Saturday October 16th from 6:00 to 8:00pm. The Pumpkin Walk itself is always a visual feast. Each year approximately 300 carved pumpkins are lighted and displayed along a trail behind the Bainbridge Gardens. How to all those pumpkins get there? Folks like you an me drop them off. Drop off your carved pumpkin to Bainbridge Gardens by Friday afternoon and they will provide the candle and put it on display. Very fun for the kids, big and small, to find their pumpkin along the trail! No admission charge, but a suggested donation supports the Boys and Girls Club of Bainbridge Island. Parking is always tricky, use caution. And if you park in an off-site parking lot, there will be shuttle service – look for shuttle signs. The chart below compares single family homes on Bainbridge Island – For Sale vs. Sold vs. Pended. You can see we had an inventory spike in July, which follows the seasonal trend of high inventory in the summer. 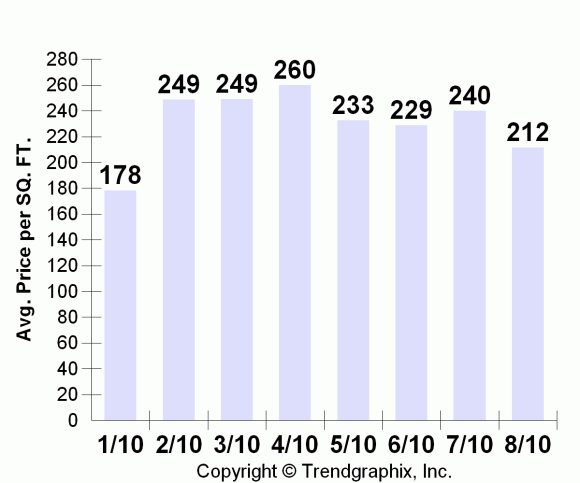 The current inventory number for September is 238, so we are already back below where we were in June. In regards to sales, April was our best month with 40 closings, the summer pretty steady with about 25 homes sold/closed per month. This month so far we have had 14 closings. The second chart here looks at price per square foot. While our price per square foot can chart a bit wildly because of waterfront homes that can sell for $600 a square foot, this chart for the year so far is mildly steady. However, I do find it interesting that in our month of highest inventory, July, we was also saw an uptick in price per square foot (there was one sale of waterfront for $556 a foot in July) . I like everyone else am curious how the year will wrap up, especially in regards to price per square foot. My prediction is we will settle in at the $200 per foot threshold and stay there for a while. Why don’t I think it will just fall out the bottom? Yes, there will be more short sales and bank owned properties on the market in the coming year, but sellers who do not have to sell are really hunkering down. Folks are renting, folks are refinancing, folks are living on one salary. People are making many changes before they have to take a huge hit on their house. 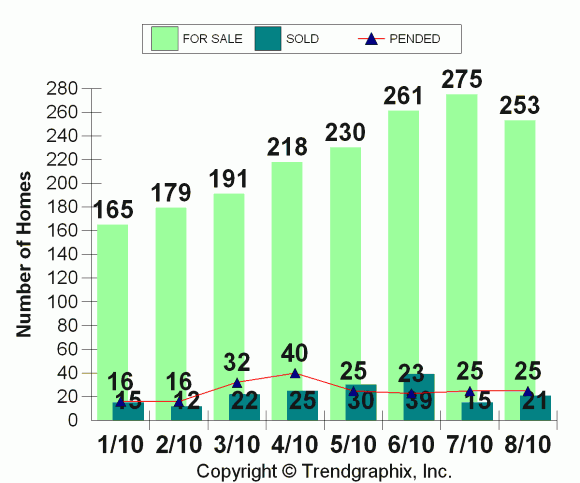 Here on Bainbridge Island when we see new (not stale inventory from last year) come on the market it gets folks attention and if it is priced correctly, it sells within 30 days. That also goes the same for stale inventory. If something reappeared this summer that was on last year, it was typically priced correctly and it too sold rather quickly. So, I predict a tighter inventory with increasingly more correct pricing will keep our market clipping along – even during the tough months that are ahead for our national economy. 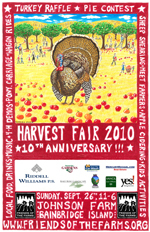 Is this Sunday's Harvest Fair on your calendar? If no . . . maybe it should be. Sponsored by Friends of the Farm, this is a favorite fall event for our family. A terrific way to kick off fall and the weather this weekend is forecasted to be sunny and 70 degrees. Shuttle Service is available – for driving directions click here. There is a donation entrance. For even more info on the day and photos from previous years, click here. (The lil' blonde one at the cider press is my daughter – three years ago – she looks so small). Hope to see you there this year – I'll be there . . . with my camera! Again, click here for driving directions. In the spring of 2008 I took a fiction writing class, from the then, not-so-well-known author, Garth Stein. He walked into class and tossed out buttons promoting his yet-to-be published The Art of Racing in the Rain. In the midst of this energetic, multi-week class, Starbucks picked up his book as one of their summer reading books, the book was then published, with great success (now a New York Times Bestseller) – and the rights to the movie were purchased by Universal – set to star Grey’s Anatomy’s Patrick Dempsey, Seattle’s very own McDreamy himself. So many Seattle connections, but I thought it was all kind of cool, especially because through Field’s End I was getting instruction, feedback, and reviews of my writing – from Garth Stein. It was also through Field’s End via one of their Roundtables, that I met Carol Cassela, shortly after she published her well-received book, Oxygen. I could go one, but Field’s End is one of the avenues that keeps me writing. My blog was born from my need and want to write regularly, daily if possible. The blog gave me another outlet to do just that. From that simple beginning, my blog evolved into a way for me to share what it is like to live here on Bainbridge Island. I remember all too well combing the internet, trying to find information and photos of what it was like to live here, but I did not find what I was really looking for. Thus, my inspiration. I love hearing from people that my blog has been useful as they research Bainbridge Island – that’s what its all about. 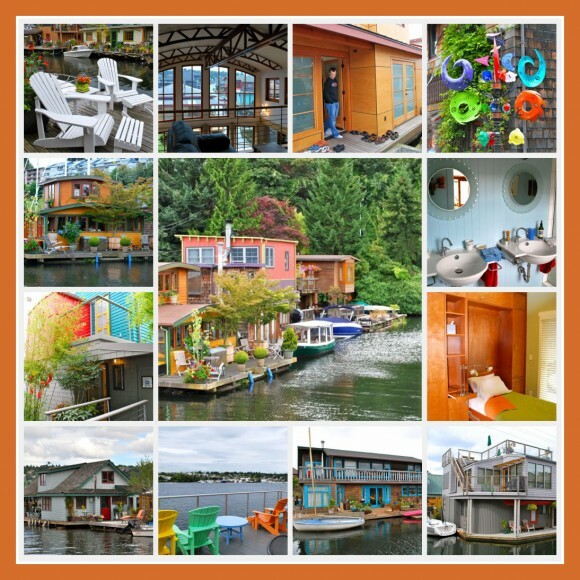 On Sunday my friend Wendy and I went on the Funky to Fabulous Houseboat Tour on Lake Union in Seattle. Floating homes have always intrigued me. And of course, back in 1993, we were all intrigued by Sam’s (Tom Hanks) hip houseboat in Sleepless in Seattle (gray home at bottom left hand corner, yes, that is the same one – just a little older, but very much still afloat). That particular houseboat is on the Westlake side, at the end of its dock and it does indeed have movie worthy views of Gasworks Park and the Space Needle. The homes on the tour were not for sale, but in the tour brochure it did note that in 2010 one of the homes on the lake sold for 1.4 million – and there were a few more that sold in the million range too. Seems like a very narrow niche market like floating homes, might not be suffering as much as some markets. While I am a huge fan of getting the most out of small interior spaces – we saw many a Murphy Bed, cool nooks, bench seats, washer and dryers in the walk-in closets, you get the idea – I was most inspired by the outdoor spaces folks created around their homes. Rooftop patios, floating patios and garden beds, funky garden art and amazing potted plants were all part of the local color. We were both impressed by the fruit trees (with pears on them, yes) and abundant vegetable gardens, potted, hanging and stacked about. What I liked best of all were the colorful, creative exteriors of the homes. A fun, vibrant neighborhood, to say the least. All day long we we had a front row view of Gasworks Park. I am used to the reverse view, so it was kind of a neat perspective change. 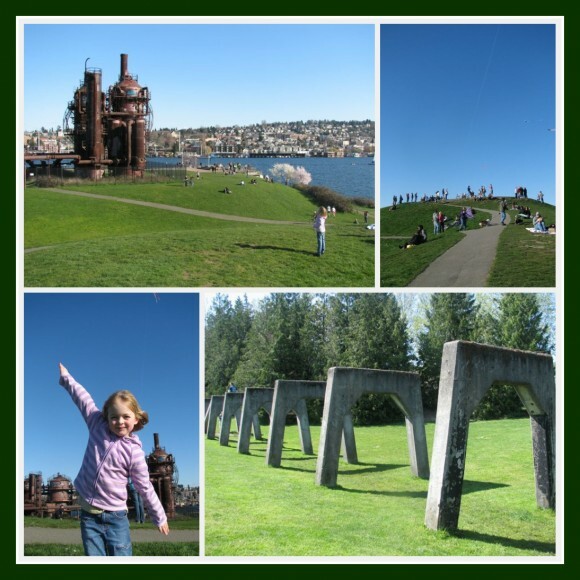 So, just a reminder that Gasworks Park, is a fun, easy day trip from Bainbridge Island. There are cool things to climb on, paths and trails along the lake – you can even pick up the Burke-Gilman Trail there. There is also the quaint, quirky hill to wind up and down (or lay on and watch the boats go by with the Space Needle in your vista) – and best of all the hill is a picturesque, windy spot to go fly a kite.